In any given debate over evolution vs pseudoscience, you'll typically hear about apes to men, or Mesonychids to whales, dinosaurs to birds, or fins to feet. But almost never do you hear about aardvarks to elephants, or elephants to manatees. 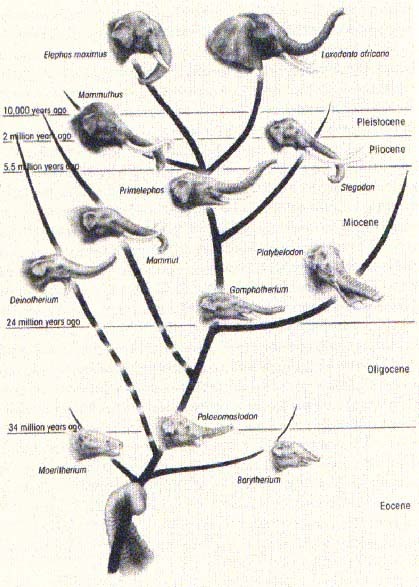 And that's strange, because Proboscidean evolution is just as fascinating as that of any other lineage. 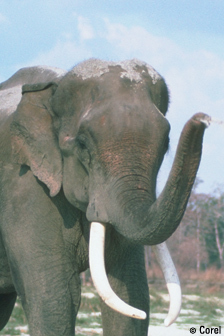 We've recently recognized two distinctly different groups of extant (still-living) species of African elephants which are closely-related, and which are both a bit more distantly-related to Asian elephants, which are even more distantly-related to mammoths, and then mastodons, (multiple species of each) and so on -to other, older, and much weirder things that are still obviously related to elephants, but clearly are not elephants, and never were. 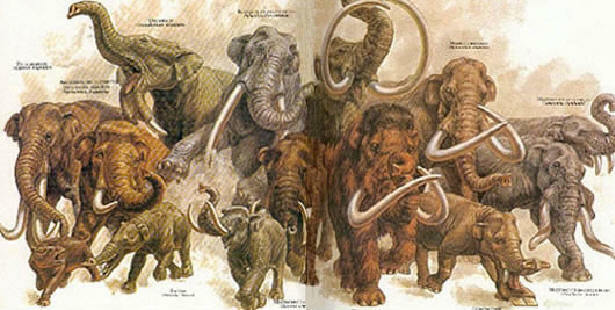 All of these listed so far are in the Order, Proboscidea, which means "things with funky noses". 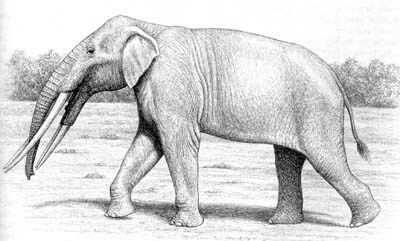 Proboscidea is just one of several orders within the taxonomic Superorder, Afrotheria, which means "hooved mammals which come from Africa, and have funky noses". 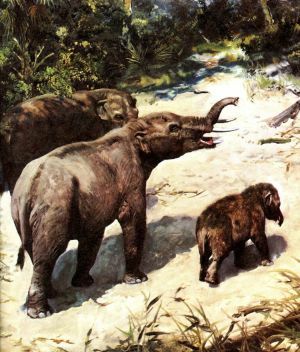 Afrotheria doesn't include any elephant birds, elephant seals, or elephants Gerald. But it does include elephant shrews, along with manatees, tenrecs, aardvarks, hyrax, dugong, dassies, and other stupid-sounding words. The aardvark is a basal Afrotherian. "Basal" means that its the most primitive-looking, ...the prototype, ...the shape of things that went. This is the one everything else was based on. 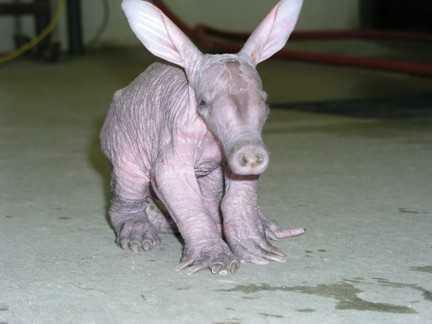 In this case, the aardvark is what scientists think the granddaddy of all Afrotherians once looked like. Amazingly, genetic sequencing says they're right! The modern aardvark could be a karyotype of what the ancestors of all afrotherians should look like. 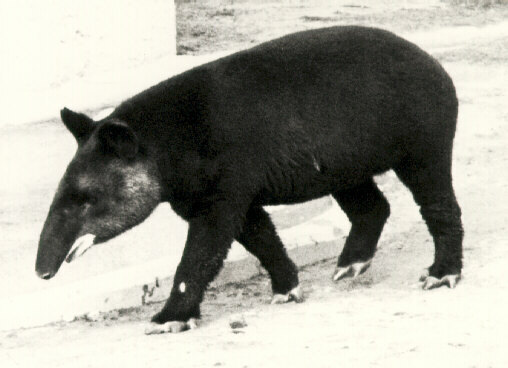 This is a tapir. It is a Proboscidian karyotype. 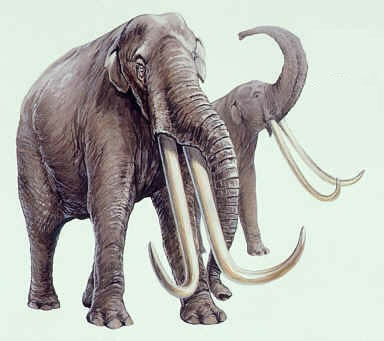 That means it looks an awful lot like what the earliest proboscideans looked like. ('Proboscidean' is a fancy word for 'elephant', remember?) 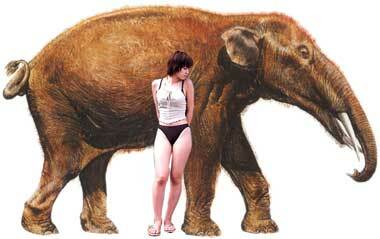 It does look a lot like the oldest fossil gonna-be elephants. But the tapir isn't basal to elephants, because it doesn't really belong to that family, it just looks like it does. That's why its only a karyotype. The Tapir is a 'hooved, funky-nosed animal that doesn't come from Africa. It looks like a wanna-be elephant, but its actually closer to rhinos. Rhinos and tapirs both have only three toes. It does look a little bit like a kinda proto-elephant, ...sort of. a "mother of all elephants", ...sort of. 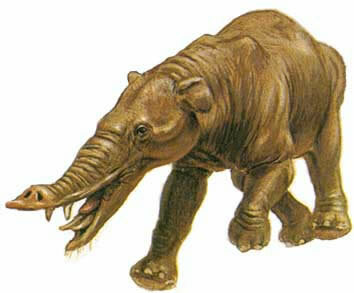 Except for the toes, Moeritherium looks a lot like a tapir, doesn't it? 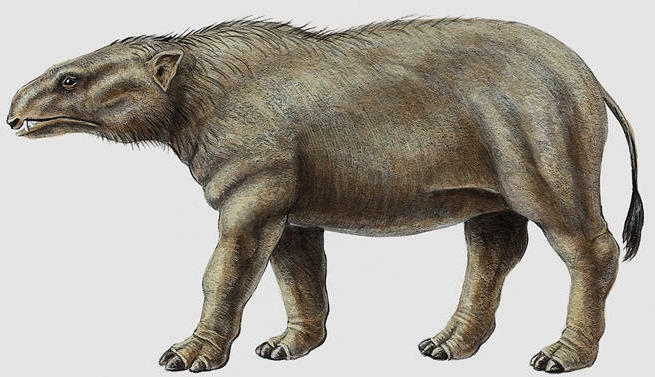 This 40 million year-old proto-pachyderm was about the same size as a tapir, and looked a lot like one. 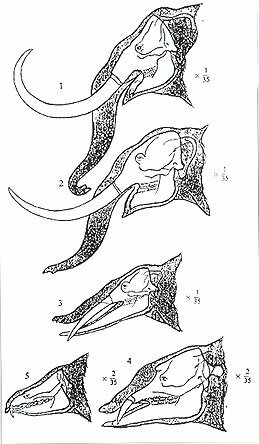 But they had slightly oversized upper incisors, which grew out pointed like fangs.and not just that; Its also a basal Sirenian too. Elephants started out as relatively small hippo-like things until their teeth went crazy and started growing out of control. This is true of the whole order. That's the nature of inherited traits. Consequently Proboscidians are all recognized and categorized not by their prehensile noses, but by their outrageous dentistry. 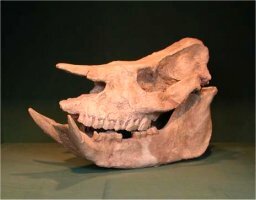 From this Chilotherium skull, we can see that they already had what were probably very short tapir-like noses but which were already helpful in feeding. And for chewing, they relied only on their molars, so they weren't so dependant on the condition of their incisors. So it didn't matter that they grew out so strangely that eventually they could use them as raking or stabbing weapons. 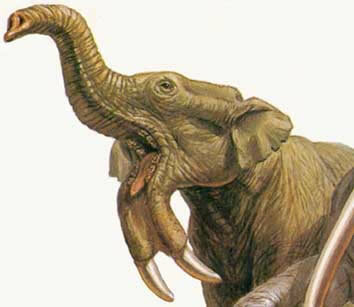 This Oligocene semi-elephant called Fiomia is beginning to look the part, and shows us how these teeth started growing a lot longer than they should have been. This Gomphotherium from about 20 million years ago represents a point in elephant evolution when both the upper and lower incisors grew to such proportions that they were unusable for eating; and of course the length of the nose had to increase right along with the teeth and lower jaw. 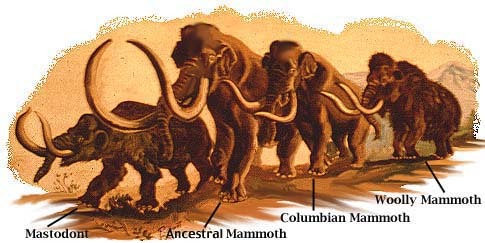 These lead to Tetralophodon, Trilophodon, Palaeomastodon, and Platybelodon. One of the interesting things about evolution and paleontology is that its sometimes nearly impossible to tell whether you're looking at two different kinds of animals, or just two different version of the same thing. Because the way evolution works, everything can be described as another version of anything else you want to put next to it. 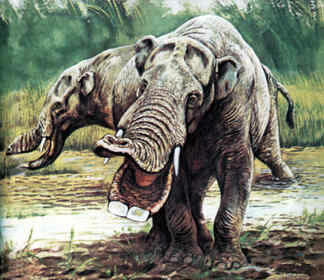 The next really important stage of elephant evolution is when the lower incisors became tusks. Some of these species didn't have such shovel-like teeth anymore, and there was a space left where the newly-lengthened nose would now slide between, so that now it could be considered a true trunk, as seen here on Stegotetrabelodon. 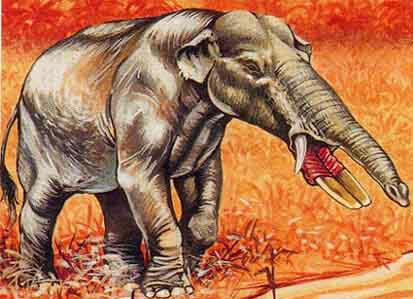 Obviously, there came a point at which these absurdly mutated teeth had become useless for feeding, which forced them to use their already-flexible noses to rake and trowel food into their mouths the same way modern elephants still do today. Initially, both the top and bottom incisors grew out as well as the lower jaw. 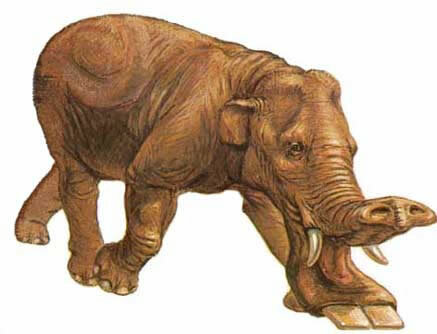 I will use this Deinotherium to represent the point at which that trend came to an end, when the lower jaw sort of "dropped off" so to speak, leaving one now-very-long nose, which was out there by itself as it is on modern elephants. The African and Asian elephants are the only ones we have left.